The scientific study of evolution began in the mid-nineteenth century when comparative anatomical studies of fossils and the diversity of living organisms convinced most scientists that species evolve. The mechanism driving these changes remained unclear until the theory of natural selection was proposed by Charles Darwin in 1858. Through comparative anatomy of over 300 real humans and animals, The Amazing Bodies Exhibition takes you on a journey through the skeletal, nervous, respiratory, urinary and reproductive systems of vertebrates. The similarity of structures within these systems, in animals that have completely different lifestyles is quite astounding. On the other hand, the diversity and differences in structures purpose-built for similar functions is also something marvel at. When you consider that the similarities and differences in these animals are brought about by variations in the sequences of only four protein bases that make up an organism's DNA; it is clear that evoluntionary adaption via natural selection really has produced some amazing bodies! Be prepared to be amazed, astounded, and sometimes confronted. Through comparative anatomy, the exhibition introduces vivid evidences on evolution of vertebrates and demonstrates both similarities and differences between diverse types of vertebrate; their way of life, biology and structure. Examining real specimens of humans and animals will take visitors on a thought-provoking journey, generating an intellectual and emotional response. Human and animal bodies need oxygen continuously during oxidative metabolism, and carbon dioxide produced from metabolism can be expelled continuously. These functions are completed by the respiratory system. Aquatic vertebrates breathe with gills and terresrial vertebrates with lungs. Gills and lungs are analogous organs (perform the same function by a similar mechanism but evolved separately), but lungs and air bladder are homologous organs (sharing similar characteristics due to the same evolutionary origin). Fish 'breathe' the dissolved oxygen out of the water using their gills. It turns out that extracting the oxygen is not very easy as air has 20 times more oxygen in it than the same volume of water. The gills are composed of comb-like filaments, the gill lamellae, which help increase their surface area for oxygen exchange. When a fish breathes, it draws in a mouthful of water at regular intervals. Then it draws the sides of its throat together, forcing the water through the gill openings, so that it passes over the gills to the outside. With blood and water flowing in opposite directions to each other, the dissolved oxygen in the water is absorbed through the filtration of the gills. Fish gill slits may be evolutionary ancestors of the tonsils, thymus gland and Eustachian tubes. The main reason why gills work for fish is the fact that fish are cold-blooded, which reduces their oxygen demands. Warm-blooded animals like whales breathe air like other mammals do because it would be hard to extract enough oxygen using gills. Vertebrates' lungs expanded gradually in it's oxygen-uptake area during evolution. When amphibians landed, their inner gills disappeared. 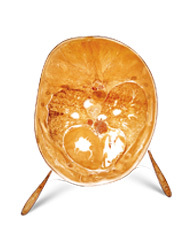 One pair of hollow bladder like lungs appeared from the pharynx to replace the original respiratory function of gills. 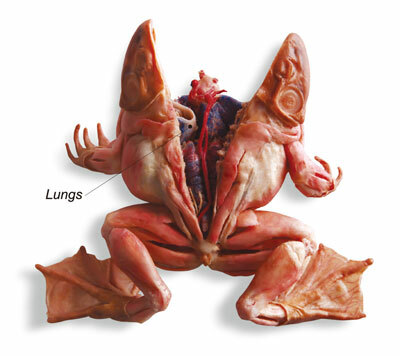 Amphibian lungs are simple in structure with a small exchanging area due to the rather smooth inner walls; therefore skin breathing is required. In reptiles, there is a pair of lungs at the back of the front thorax with the bronchia extending into the lungs and branch out - making the lungs sponge-like. Hence, reptiles have stronger exchange effeciency of air than that of amphibians. They have roughly the same lungs (both bladder-form) as amphibians, but the lung structure is more complicated and efficient. The left lung of the snake has degenerated and is smaller than the right one, which is long and takes up most of the cavity space. The bird's lungs have extremely large area of contact with air and are unique and effecient air exchanger. Birds have quite developed air sac system to connect with the lungs. Air sacs provide birds with a unique method of "dual respiration", which adapts to high consumption of oxygen during flight. By flapping their wings when flying, air sacs expand and contract continuously to guarantee adequate supply of oxygen. Birds have higher rate of metabolism and need effecient breathing; therefore, the lung structure is complicated and special. The lungs of mammals take up a great part of the chest cavity, and are much larger than that of low-level vertebrates. The lungs have a complicated bronchial tree inside. Bronchia enters into the lungs and branches off into numerous small vesicles. Left and right lungs of different mammals have different lobes. A few of them are not divided into lobes, such as that of the whale. No matter the are divided into lobes or not, the right lung is generally larger than the left lung. Plastination is an innovative process developed in 1977 by German doctor, Gunther von Hagens. Natural body fluids and fats are replaced with special plastics, making the cadaver virtually incapable of decaying. The resulting preserved specimens remain odourless and completely dry. You could probably think of them as modern day mummies! This method of preservation ensures that all pathogens, bacteria and viruses that may occur in a body are totally destroyed, leaving a perfectly sterile and safe specimen for educational purposes.